Brunch with my best friend Kelley is pure bliss. 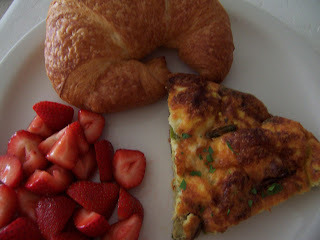 Fresh warm croissants that she picked up, mimosas made with cava, Chambord and orange juice, fresh strawberries and a quick and easy asparagus frittata. All that followed by a messy but great painting project and then hours at the pool with frosty beers. Thanks Kelley for the croissants, the wine and best of all, your friendship. Love you and can't wait to see you two tomorrow at our barbecue! Preheat oven to 400. Saute asparagus and shallots in olive oil in an oven-proof saute pan, salt and pepper to taste. Remove from saute pan, add more oil to pan to prep for eggs being added. Meanwhile, mix eggs and half and half until well incorporated, salt and pepper and add parsley, reserving a sprinkle for garnish if desired. 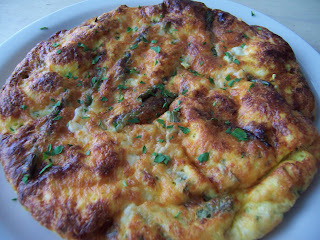 Add asparagus and shallot back to pan, spread out evenly and pour egg mixture over the top. Cook until bottom is beginning to firm up. Next, top with cheese and place entire pan in oven and bake until cooked through and puffed up. Quickly place under broiler to brown. Slide out of pan and slice and serve. Good foods, good friends. Can't go wrong. I agree with Peabody - the perfect combo! Thanks Peabody & Patricia - it was such a fun day! What you described is my favorite part of Phoenix summer weekends! Enjoy!